Uber Spent $10.7 Billion in Nine Years. Does It Have Enough to Show for It? What makes Uber Technologies Inc. the most valuable venture-backed technology company in the world? Investors say size and growth. The business is transforming global transportation networks. On closer inspection of its financial performance, Uber also pioneered a very expensive way of establishing a market and staying on top. At the same time, Uber has worked to downplay its persistent losses. Because the company doesn’t disclose financial results with much consistency, it’s easy to lose sight of how much of investors’ money Uber has spent. Since its founding nine years ago, Uber has burned through about $10.7 billion, according to a person familiar with the matter. Over the past decade, only one public technology company in North America lost more in a year than Uber lost in 2017. 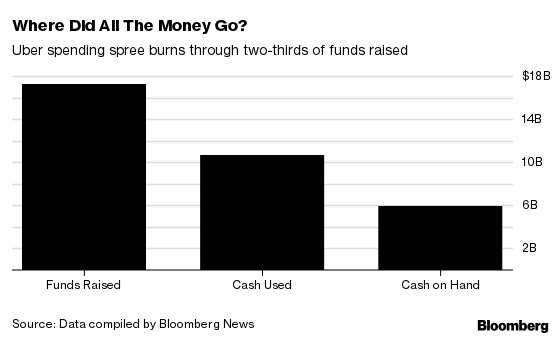 None has burned such a tremendous amount in the first stage of its life, according to data compiled by Bloomberg. 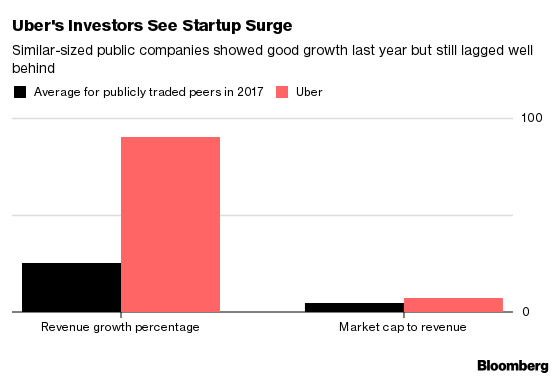 Investors have contributed $17.3 billion to Uber, said the person, who isn’t authorized to discuss the figure and asked not to be identified—an enormously long leash for the company to experiment with and subsidize global growth. Figuring out whether that investment will pay off is partly based on what you think will happen to Uber’s losses. An analysis of Uber’s financial position, based on Bloomberg reporting and voluntary disclosures by the privately held company, shows that Uber is a corporate anomaly. Few companies in history have grown so fast or lost so much money in such a short period of time. Uber has developed what may be considered a Peter Pan syndrome. After reaching a stage of maturity most companies never realize, it has yet to turn a profit and remains deeply in the red. Typically, when a business posts a multibillion-dollar loss, it’s followed by many quarters or years of penance. Hewlett-Packard reported a loss of $14.7 billion in 2012, mostly due to the discovery of financial falsehoods related to the acquisition of Autonomy. HP made up for that loss in subsequent years when it generated billions in profit. The only other public tech companies that have come close to rivaling Uber’s ability to lose money are chipmakers. In 2008, Micron Technology Inc. reported a net loss of more than $2 billion at a time when its main memory chip products were selling for less than the cost to produce. Things were bad, and yet, it was less than half of Uber’s $4.5 billion loss last year. Amazon.com Inc. is famous for its losses over the years. But even in the heyday of the dot-com bubble, the e-commerce giant never came close. Amazon’s biggest loss was in 2000—a $1.4 billion embarrassment, or about $2 billion adjusted for inflation. Most years, Amazon turns a profit, albeit a small one. What Uber backers can point to, though, is a nearly unmatched pace of sales growth. Even as Uber’s revenue reached $2.3 billion in the fourth quarter of 2017, its annual growth rate remained strong, at about 90 percent compared with 2016. That’s faster than most tech companies with a similar valuation. Only one U.S. tech company of Uber’s size, Micron, grew at anything close to that last year. Uber delivered triple the sales growth last year of the average tech company in North America valued from $40 billion to $60 billion. But does that make it a good investment? 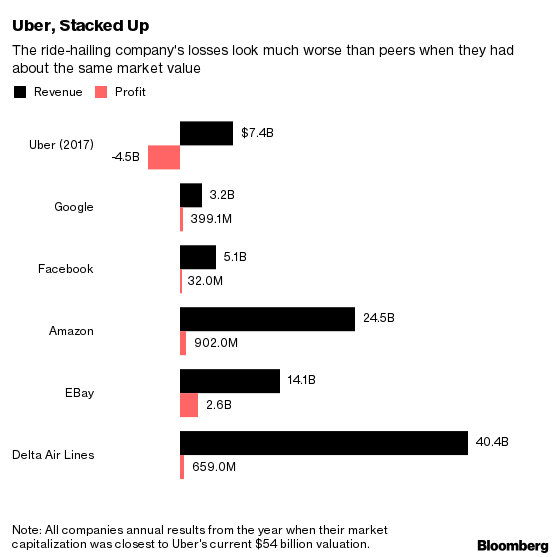 Judged by sales-to-market value—one way to decide whether a company has already become expensive relative to its peers—Uber’s valuation is 7.3 times annual revenue. For the comparison group, that ratio is 4.2 times. The lower the ratio, the better deal you’re getting as an investor. Uber is quite expensive judged purely on annual revenue. Investors usually prefer to evaluate companies on price to earnings, but, of course, Uber doesn’t have any, so that’s not an option. Making matters more complicated, the financials Uber has long given shareholders and the media presented a prettier picture than reality. Uber traditionally prefers a loss calculation that doesn’t include interest, tax, stock-based compensation and other expenses. This adjusted accounting downplays the scale of Uber’s losses over the years. Uber has said adjusted numbers better reflect its business. However, it agreed to share financial details with Bloomberg for all of 2017 using both accounting practices in an effort to be more transparent about its business. Back in the dot-com days of the late 1990s, a similar measure was favored by analysts trying to persuade investors to put money in untried companies. It was mostly abandoned after many of them failed to make the difficult journey to profitability, and investors started demanding concrete results and a clearer picture of the bottom line. Uber is well-advised to follow suit before selling shares to the public as early as next year.